When my daughters were babies we tiptoed around the house, praying not to wake them. Carrying a little monitor around with me alerted me when they were awake, but I was often found opening their squeaky door to peek in on them…which also often found them startled awake. 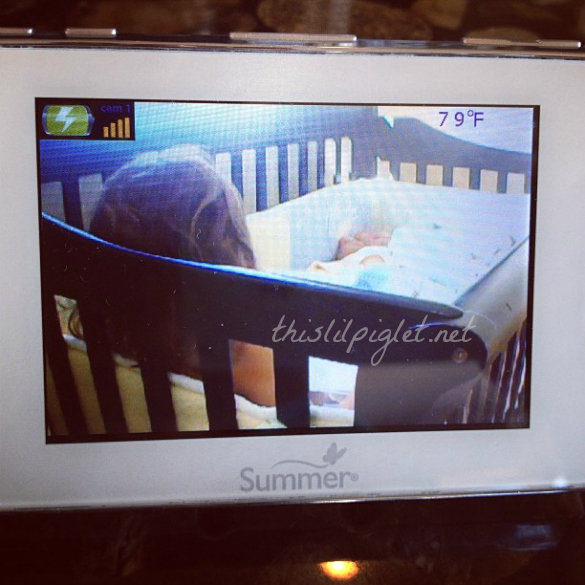 These days there is a FANTASTIC option which I only wish I’d had, the Summer Infant Baby Touch® 2 Digital Color Video Monitor. The Baby Touch® 2 Digital Colour Video Monitor reminds me of a miniature tablet; with touch screen capabilities on the 3.5″ video screen, you can keep an eye on your baby without having to peek in on him and risk the chance of waking. Thank you to Stacey of ThisLilPiglet for photos of her gorgeous wee man. The monitor is easy to use; once you initially plug in the monitor and set the video monitor into position, the receiver monitor can easily manipulate the direction of the camera to move around the room remotely. The receiver displays the room temperature so you can ensure baby won’t be overheated and by the push of a button, a fussy baby can be soothed by the sound of your voice remotely. The video monitor automatically converts to black and white night vision and continues to make monitoring my baby easy from day to night. Interestingly enough, the Baby Touch® 2 Digital Color Video Monitor works well for sneaky toddlers too. On one specific morning not too long ago, Stacey from ThisLilPiglet could hear her baby chattering only to view her toddler sitting inside his crib, books in hand. Before long she was explaining the pictures in the book to her baby brother. Had she not been able to watch closely from the monitor and to speak in to remind her to sit still, she might have been worried but I watched for awhile and watched a very touching moment unfold before her. Award-winning touch screen baby monitor is the ONLY one of its kind. Featuring an innovative, high resolution 3.5″ color video screen and an easy-to-use touchscreen interface, the Baby Touch Boost gives parents controls right at their fingertips to conveniently and securely see baby, day or night. Sound activated LED lights, power-save video on/off and low battery and out of range indicators. Wall-mounting hardware included, adjustable/swivel design allows for optimal positioning on baby. To connect directly with Summer Infant, head over to their Facebook Page or Twitter. 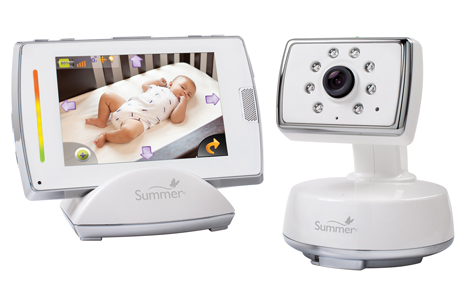 Summer Infant has provided one monitor valued at $269.99 to giveaway to one very lucky US OR Canadian reader. To enter you must be 18+. Simply fill in the form below to enter, giveaway ends December 5th. Winner has 48 hrs to respond. Would LOVE one of these!! It would help me supervise my 4 little people! We are expecting a baby boy THIS WINTER!!!! It would make my year to win this monitor!! :) Thank you for hosting this giveaway!! Having a monitor would be good to see if the kid is just a bit awake or fully out and about so to speak. it wouldn’t help me, but it would help my daughter’s friend. She’s going to be a new and young (18) mom..she can use all the help she can get! My niece is expecting her first baby in January … it would make a wonderful gift for her! This would be awesome for my daughter. With two new grandsons we need all the eyes we can get. My niece just had a baby so this would really come in handy for her. I can’t beleive how fancy baby stuff is these days! This monitor would be a great help to any new parents to give them peace of mind. I would love to give this away as a gift to someone with a new baby! My friend is a new mom again after, 10 years, this would be soooo awesome to share with her and her family. What a chance to see how far we’ve come, and peace of mind for Mom & Dad. I would give this to by best friend who just had her baby. She lives on a farm and needs to do chores, so it would be perfect to watch the baby and do chores at the same time. I’d giv it to my friend who is expecting. I wouold give this to my sister, she could use it very much. I love the idea of not only being able to hear but see baby too. This would help me because my baby is a bit of a monkey and I would love to be able to SEE her with a monitor, rather than just hear her. Sometimes I check on her because I need to see what she is up to, but then I sometimes ruin her sleep because of it – if I could see her without having to go in and check that would be awesome!! My nephew and his wife are expecting their first in the New Year and I am sure as first time parents this would help give them some peace of mind. My niece is expecting a baby late January and this would be an excellent gift for her. She wouldn’t have to constantly walk up stairs to check on her baby. This would help me for a baby shower gift for my brother and his girlfriend who are expecting their first baby. A lot! My baby sleeps very soundly. I’d love to be able to check on her without waking her up. It would help me have peace of mind and would save me from accidentally disturbing little one by going in and checking to see if they’re okay if I don’t hear them. I’d give it to my niece as a baby gift. It would help me keep an eye on our future new addition. This monitor is the cat’s a**! Instead of relying on just listening I could actually see what she was up to in her crib! I want this monitor so bad!!!! I would use this monitor to keep on eye on my daughter when she sleeps! I would use the monitor with my daughter. She often makes noise while sleeping, but I think she is still asleep. However, if I were to look in on her, that would certainly wake her up. Having a video monitor would allow me to see what she is doing, if she is up, or just making noise while she sleeps. This would help me keep an eye on my grandson while he’s in the playroom. My daughter is such a light sleeper, it would be great to watch her without going upstairs and risk waking her up! This would help me to keep an eye on my kids. Actually, if I win this, I would give it to my neighbor who has a 2 month old baby girl and she doesn’t have a monitor. My Baby days are over ( 2 Teen Boys) but my little sister is expecting so as an to be Auntie I would love to gift this to her. this would be awesome for my new grand baby coming …. It would help me help my cousin who just had a little boy, they thought they were done so they gave away all of the baby things! So now they have to start all over and get things and this would be great to be able to give them. I would love one of these! I have a friend who is having her 3rd child and this would be amazing for her! It would be great to see what she was doing instead of just guessing from the babbling. Not having to run into babys room every time I hear a peep. The video means I can see if he is awake or just shifting etc. I would actually like to gift this to my girlfriend who is having her first baby and it would help her have some piece of mind. My daughter is going to have her first baby and she needs one badly. I’ve got an old monitor that I’m using right now as I write. It has no video and has a ton of static and the cord isn’t the original so it doesn’t quite fit in the the one end properly — you have to jiggle it a bit. So basically a new monitor would be awesome so I could have a properly working one and one that I could see what he’s up to as well for extra peace of mind. My three year old has this terrible habit of getting out of bed. I would love a video monitor so I would know for sure before going into his room. I have 2 autistic boys. This would help me so much with while they play and I am cooking or cleaning to make sure they stay playing in their room or sleeping. One also sleep walks and knows how to get out the front door. So we have been nervous since that started. we are expecting and do not have a baby monitor yet! I would love to be able to see my daughter when she is fussing to help determine weither she has to stay and cry it out a bit or if she is in real distress. Thanks! I would love to use for my baby so that when I’m in another room I can see if he is sleeping or awake or crying and I can go tend to him. I would love this for my son’s room. I go in his room several times to make sure he is ok. This would help so much!!! Stinking autocorrect. My name should be nici not nice! I would give it away, as I never had any children. being able to actually SEE the baby just brings so much peace of mind, thanks Julie! I have my first Grandchild on it’s way! I would love to give this to my son & daughter in law for the baby. It would provide piece of mind, Thank you for the chance to win! I would keep this for myself as I have a baby on the way. I would love to open this on Christmas morning. So would my husband!! This would help me monitor my baby without going in the room to see him. I don’t have a monitor, so im still uncomfortable leaving him in his room for very long. this would give me peace of mind! this will be a great gift to my cousin who is expecting her second baby after 8 yrs. She would be delighted. I’m expecting and I’m deaf so this would work perfectly for me! I would give it to my son and his wife who are expecting a new baby. I think this would be the perfect baby moniter for them to have for their house. This would put my niece (an new mommy) at ease. This would give piece of mind to everyone, and eliminate waking up the baby to see if she is sleeping. This would help my sister in law keep a close eye on my nephew with special needs while he’s sleeping. I would love this for a friend. She is a first time mommy and i think this would give her much piece of mind! This would be a great gift for my sister, who doesn’t have a monitor yet. It would allow me to have one monitor with multiple cameras to supervise all the kiddos and not have different monitors plugged in all over. this would be great for my newborn whom I am expecting in April 2014! the large screen on the monitor looks great!